Reliable High-Speed Wireless Internet for the Marina del Rey, CA Boating Community. DigiLink's carrier grade, state-of-the-art Synchronous Fixed Wireless service can provide your slip, home, condo, or apartment with high-speed wireless internet bandwidth from 1.5 Mbps to 5.0 Mbps. What is the total of 1 + 5? DigiLink offers Synchronous Wireless Internet, providing the Marina del Rey boating community with with carrier-grade tough, high performance, fixed wireless Internet service. Fixed High-Speed Wireless Internet Connectivity for your Boat. Synchronous Wireless is DigiLink's carrier grade, state-of-the-art fixed wireless service. DigiLink's Synchronous Wireless service can provide your slip with a fixed, high-speed wireless Internet bandwidth from 1.5 Mbps to 10 Mbps. Synchronous wireless is a GPS timed system that provides 100% CIR and QoS to support all applications and voice services. 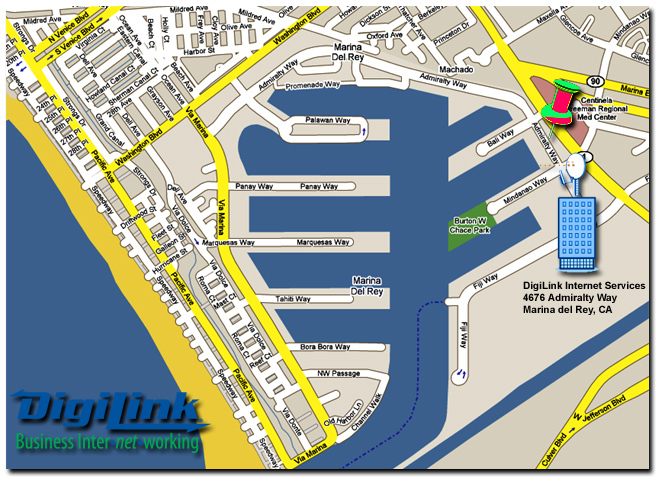 DigiLink's Synchronous Wireless meets or exceeds the reliability of standard T1 wired services that boaters in the Marina del Rey community can rely on. Imagine, before pulling out of your slip, you're able to download the most recent Navigational Charts to your laptop, or downloading the latest DIY e-book on maintenance, installations, repairs for your sailboat. Or what about placing a phone call to your stock broker prior to setting sail? How about downloading that new action-adventure movie for that long trip to Baja California? Imagine doing all these things online - without wires, and at a speed many times faster than the typical Internet connection in your home. And, at a price point that is much more cost effective than most data plans. *-Some restrictions apply. See below. Q: Is DigiLink's carrier-grade, high-performance fixed wireless Internet service weather proof? A: Extreme weather can affect all communications. The technology employed in our wireless solution when installed correctly in an upright position operate at frequencies that are not affected by weather conditions. Our wireless service is field proven in hot, cold, wet, humid, and windy conditions. As a matter of fact, our fixed wireless Internet solution is already installed and functioning as advertised on several boats in the marina. This service is ideal for slips in the Marina del Rey boating community. With competitive pricing, fast installation times and flexible high-bandwidth options, DigiLink's fixed wireless broadband solution is ideal for the Marina del Rey boating community and MDR neighborhood. M-F 9-5 support via local live technical support is included with your Fixed Synchronous Wireless Internet Service. We engineer high performance service directly from your network to the core of our fully switched network, via carrier class fiber optic connections. This results in a completely uncongested connection with one hop onto the internet, without the need to go through clouds or failure prone remote points of presence. # Coverage area is within 10 miles of our office tower in Marina del Rey, CA on Admiralty Way, and there must be line of sight between your slip and our office tower. # Setup costs do not include inside wiring from antenna location to customer's equipment. # Bandwidth may be limited based on distance and other factors that can only be determined at time of installation. # This service is asymmetrical bandwidth. Download bandwidth will be different than upload bandwidth.